Alex was kind enough to bring a bunch of games he owned that he knew I was interested in playing. I jumped straight at Libertalia. We'd just set up a game when three new guys arrived. We could hardly leave them playing on their own and they expressed an interest in Ghost Stories so I dropped out to teach them that. Libertalia would have to wait for another day. I guess we got around 17 people this week so a pretty good turn out. Term time starts soon so there will probably be a bit of a drop as people leave for university. 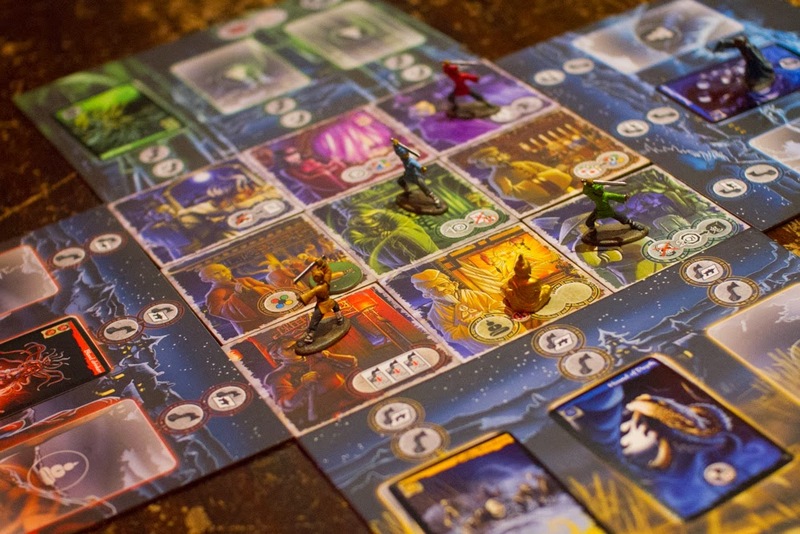 It had been a while since I'd played Ghost Stories and I wasn't a hundred percent sure on all the iconography on the cards but apart from a couple of minor mistakes I think we got by without too much accidental cheating. As it was the other guys' first time playing we chose the easiest setting. A couple of rookie mistakes that I was as much a part of as anyone else meant we got a few haunted tiles pretty quickly but we managed to flip them back using the blue monk's double action ability. In the first third of the game the board was looking pretty overrun and I thought we were at the point of no return but with a few lucky dice roles we managed to clear most of the ghosts from the boards. One of the guys had to leave but the nice thing about a co-op like Ghost Stories is that we could just continue with a player down, democratically taking his moves for him. As Wu Feng appeared I took a hit for the team and my monk was killed. Wu Feng's incarnation required four reds to be destroyed. The plan was for the yellow monk to use his bottomless pockets power to grab a bunch of red tao tokens and head over to Wu Feng to take him out. We set Circle Of Prayer to red to make the exorcism easier but before the yellow monk made it over the blue monk made a perfect roll (well, a red and two wilds) and took out Wu Feng on his own, stealing the glory for himself. We did pretty well in the end and I think we would have probably beaten it on the normal difficulty rather than initiation. I hear Libertalia went well. Dan said he enjoyed it but he won so he would have enjoyed it. It's a kind of pirate ship themed role selection game. I'm hoping Alex will bring it another week. After that they played Coup. Pandemic and Ticket To Ride was at other tables. Mike turned up with Taluva, a game he'd been promising to bring for a while. He'd likened it to Kingdom Builder; an interesting, slightly abstract strategy. The game didn't disappoint. For a start it looks great and the tiles are so thick and chunky, the kind of components that beg to be touched. 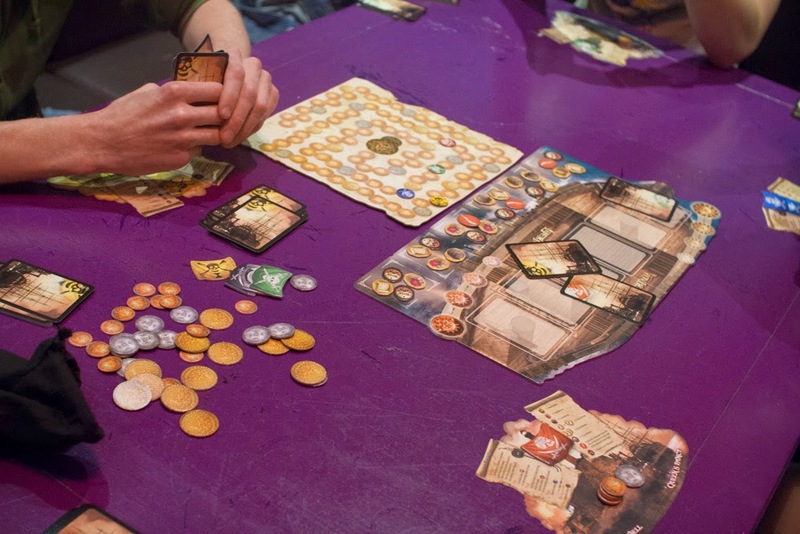 First I played it with four players and it was a quick, fun little game with a bunch of interesting choices. Towards the end it could have been anyone's game and everyone did their best to block the next player from getting the final move they needed to win but pretty soon there was nothing that could be done and Adam claimed victory. After this I played it two player, head to head with Mike. Maybe it was just because I had a feel for the game, but it really seemed to shine with two players. Instantly I could see how my decisions really impacted the game. After a strong start in the early game I made a couple of mistakes. I was sure Mike was going to win but before I knew it the last tile had been drawn and the game was over before Mike had managed to make a comeback. On the table next to me there was a game of Space Cadets: Dice Dual and some more Coup. Next week is freshers' week so we'll have to wait and see if there's enough room for students and board gaming nerds, or if we've been shunned for the night by the cooler kids.